Bees are the “A Team” of pollinators. Nothing and nobody pollinate plants better than bees. “Nothing” means all other insects and “nobody” is anybody because scientists have tried to out-pollinate the humble bee with little success. Dust and liquid mixes of pollen were sprayed with less than spectacular results. Pollen was even packed into bombs and shotgun shells, but they were also less effective and, of course, substantially noisier than bees. Sure, there are self-pollinating plants around, but the fact is that over 90 percent of the plants on earth still depend on insects for pollination. In order to attract bees, experiments were performed to gauge bees’ ability to smell scents and see colors. The findings determined that the bees’ sense of smell is similar to our own—they like sweet-smelling blooms, too. In addition, bees can see and distinguish all colors except red. Armed with this information, it is easy to pick out perfumed flowers that are prime bee-attracting plants: Phlox, soapwort, honeysuckle, four o’clocks, forget-me-nots, jasmine, nasturtium, lilies of the valley, heliotrope and nicotiana are just some of the many fragrant bloomers that can really bring in the bees. In addition, bees are attracted to scented herbs such as rosemary, borage, sage, thyme, catnip, chamomile, lavender, basil, marjoram, hyssop and, of course, beebalm. Bees are partial to native plants, too, and there are plenty to choose from that can also be colorful additions to the garden. Wild indigo, black-eyed Susans, swamp milkweed, goldenrod, echinacea, gaillardia, yarrow, foxglove, zinnia, Joe-pye weed, penstemon and sunflowers are some of the best bee magnets that double as eye-catching, indigenous ornamentals. And if you want to attract bees visually with flowers, note that their favorite color is yellow. After yellow, blue and purple are preferred. As mentioned, bees are color blind when it comes to common red. To them, a red flower appears green, so it is hidden in the surrounding foliage. However, there are some red flowers that have ultraviolet coloring mixed in, which make them appear blue to bees. Corn poppy, pansies and beebalm are good examples. 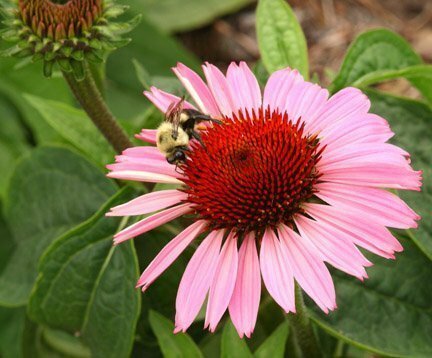 Whether you choose to attract bees by scent or color, make mass plantings to intensify the effect because one or two plants won’t turn too many bees around.